No one likes to think about crisis preparedness. That’s why so many people are not prepared when a crisis occurs. 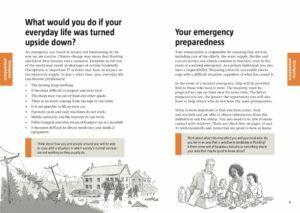 Nudging people to be prepared is no small feat. It requires equal parts emotional consideration, comprehensive intention + just enough assertive urgency in order to be successful. It’s a rare thing when it’s even a little successful. 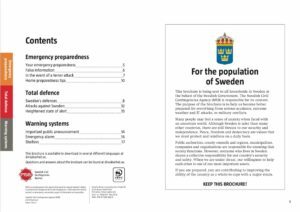 The 20-page pamphlet is illustrated with sirens, fighter jets + families fleeing their homes, is also designed to prepare Sweden’s population for cyber and/or terror attacks and climate change, + even includes a page on identifying fake news that would mislead them. It begins a conversation about how to manage without access to heating, food, water, cash, communications + many of the other things we all take for granted during times of peaceful prosperity. It warns that “states and organisations are already trying to influence our values and how we act … and reduce reduce our resilience and willingness to defend ourselves”. Handy + important tips for all, everywhere. 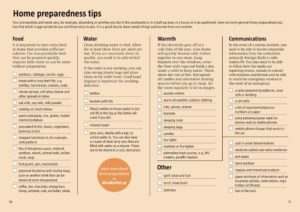 A detailed guide of “home preparedness tips” advises to stock up on water, warm/outdoor clothing, camping gear + “non-perishable food that can be prepared quickly, requires little water or can be eaten without preparation”. Stylistically, this guide is top drawer. I haven’t ever seen such a triumph in UX design to transmit such intimidating but important + often complex concepts in a format like this. It’s actually almost friendly + not intimidating at all. Honestly, though, how can a crisis management guide not be at least a little intimidating to the average bear? For a crisis management handbook to have achieved this level of accessibility, well, that’s saying something. We can learn from this success. It’s obvious the Swedes put a great deal of thought + intention into this publication that went out to 4.8 million households. Let’s trust this is an inspiration to other governments to advocate as strongly for their own populations with such care + attention to detail.